I last looked at the race to a billion in March 2011. Since then, I’ve been updating and adding data to the set giving a broader selection of platforms to compare. Before we dive in, an explanation: the initial review excluded Windows (PC) and Facebook mainly because (a) the ramp scale I’m using is about a decade in duration and (b) I was reluctant to compare platforms that require payment to join to those that don’t. The (DOS/Windows) PC ramped over several decades (starting in 1981) and Facebook is a service that costs nothing to join. There was much gnashing of teeth and shaking of fists as a result. Therefore, in the interest of inclusion, I added both to the data set and let the chips fall where they may. The data is shown below. I kept the scale to about a decade so that individual lines can be resolved. As a result, you’ll note that although Windows reached one billion first it did so slowly enough to be off the scale shown. Indeed, the “race to a billion” should be titled “The race to one billion users in less than a decade”. Game consoles seem to saturate at below 100 million total. 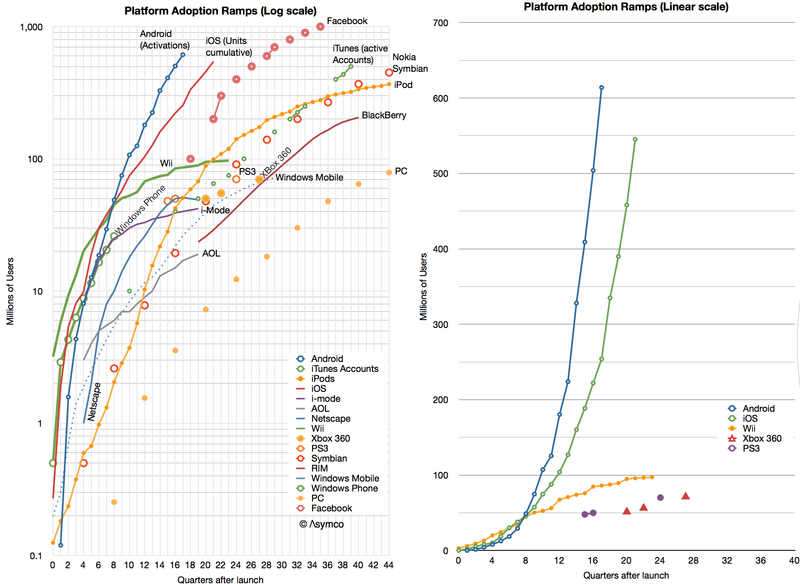 One can see the difference in ramps between recent mobile platforms and consoles in the second chart. There might be implications for which platforms will end up dominating the entertainment industry. There should also be some explanations of why consoles are so limited. iTunes accelerated with iOS and left the iPod behind. This is unsurprising but it shows that a content platform can be more flexible than one attached to any particular device or architecture. An important lesson perhaps for those in the content businesses. Early mobile platforms like Nokia’s Symbian, RIM BlackBerry and Windows Mobile have faded indicating that there was no early-mover advantage in platforms. The same can be said for early PC platforms. Windows Phone began by tracking the Android/iOS ramps but seems not to be accelerating into its second year in a way that implies potential parity. Although Facebook did reach 1 billion rather quickly the slopes of Android and iOS indicate that they may overtake it in overall ecosystem size.